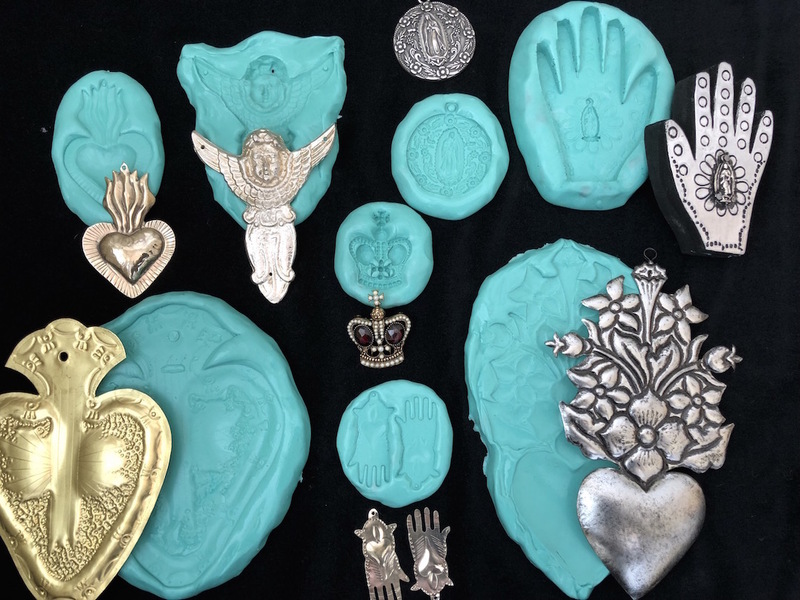 Students in this class will experience the thrill of making their own molds that will then be cast with polymer clay to create beautiful, artful objects that can be used in all sorts of mixed media projects from mosaics to jewelry. This is pure fun! 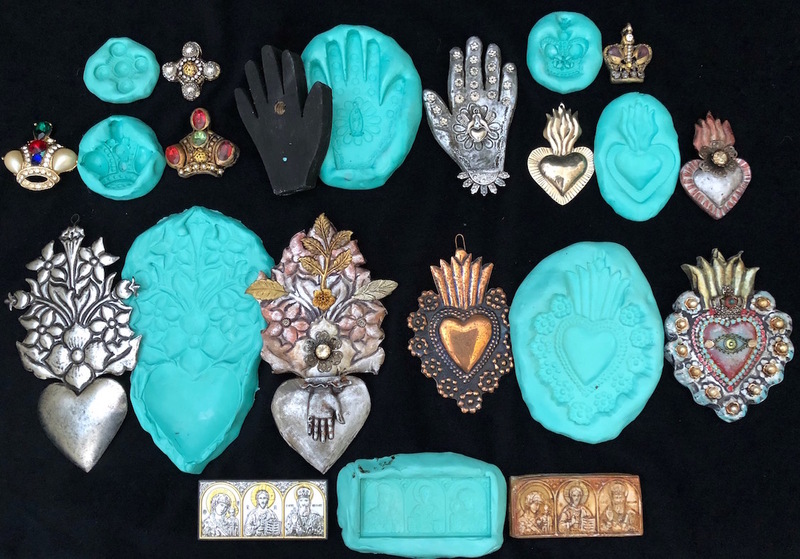 My obsession with creating molds began many years ago to duplicate "precious" items I gleaned while traveling. Students will use a high quality mold making material and will make molds of a few of their precious small pieces that they bring to class. I will also have a variety of wonderful objects that they can make molds from as well. 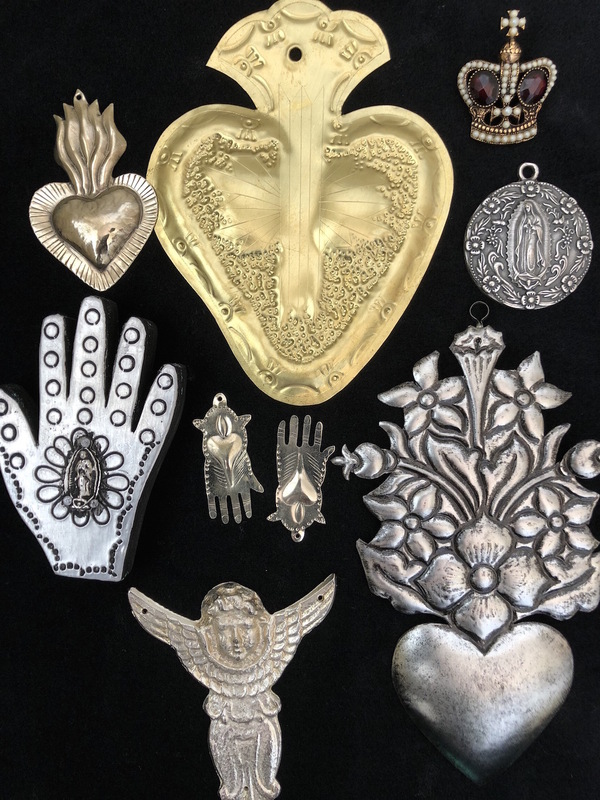 Students will then use their own molds with polymer clay, cast their object, paint it and embed it with beads and small jewelry parts to create truly unique elements. 4 small (2 ounce) packages of Premo polymer clay. The colors of your choosing but include one package of white/tan clay. NOTE: the darker colors like black, graphite, gray and brown work well if you want your cast pieces to end up looking like rusty, metal pieces. Make sure clay is SOFT to the touch before buying. The softer it is, the easier it is to use in molds. If it feels rock hard, don't buy it! Please condition clay prior to class by kneading it until soft, then rolling into a ball and then storing it in a baggie. A few small pieces you want to cast (not larger than about 3 inches) I will bring elements to cast as well.